Learn the essential anatomy you need to know – quickly and easily! 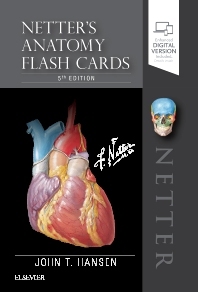 Each flash card in this full-color deck features high-quality Netter art (and several new paintings by Dr. Carlos Machado), numbered labels (with hidden answers), and concise comments and clinical notes for the most commonly tested anatomy terms and concepts. Focusing on clinically relevant anatomy, this easy-to-use, portable study tool helps you learn anatomical structures with confidence! A perfect study aid and complement to Netter’s Clinical Anatomy, 4rd Edition concise textbook and Netter’s Atlas of Human Anatomy, 7th Edition.